I saw that thing a couple weeks ago while walking down Chapel Hill St. As I walked past the alley and glanced down there I literally froze in my steps. I figured it was part of a building on Orange St., and that certainly looks like what it's connected to, but man, that's cool. I'm with you two - this could be a very cool space; more cool funky spaces in downtown are definitely in order. I think the general idea is that we have to bring in big fancy development, and this kind of space may follow (or not.) But I think cool unique spaces, done well, are as important, if not more so (my true opinion) than the big projects in attracting people to downtown. Good point, kat, I should have spelled out LLC. I'll also mention that LLCs are often used as a development structure as well - i.e. Greenfire, Scientific Properties, etc. form a new LLC with each new building they develop. It's one way of compartmentalizing the risk. I'm with the crowd on this one. What an amazing space this could become. Michael: Is this where you want to put the geek monastery? Heh. The thought had occured to me, but it's not enough space, I think. I actually found the perfect building for it across from SEEDS in East Durham, but, um, there's that lack of money, lack of time, lack of organizational ability, and complete lack of knowing what I'm doing. It would be nice to have an aerial shot of the block before the motel and some of the other properties in it were built: maybe that way one could discern how this building wound up so peculiarly placed. The closest I can find on this site is here, but I can't really figure anything out from it. Gary -- Cool; thanks! Now it kind of makes sense: a large parking lot communicated with Parrish and was in front of the odd-shaped building. Then I guess there was an infill building on top of the parking lot. Odd. No problem - what I was alluding to with the part about the building demolition is that the parking lot was brand new in 1959. For ?? ?~50 years prior to that, there was a building on that spot, thus there was likely no access to that little structure from Parrish. I've been told the story for this building before...I can't remember the details right now but will try to go back to the source. I co-sign on the bar/jazz club/gallery idea!!! so here I am in person, donald, the guy who owns 120 west parrish street. I also think it's one of the coolest buildings in durham (if not the triangle) slowly I'm working towards plans of a funky mixed use, apartment upstairs, speakeasy downstairs type of use...we have a design just have not moved forward yet...too many things going and waiting for some of the durham rehab to finish to dovetail it in with the changing landscape---strange to google the address and find this blog though---glad you like the building---I get lots of suggestions of what to do with it...most of them are "give it to me!" The Sanborn maps offer some tantilizing clues about this building. I went back to 1907 while assisting a patron and could trace the building outline back that at least that far. I came across this building on a lunchtime walk around downtown. It was so odd I came here to see if I could find out more. Open Durham delivers :). Since your 2007 photos, the ceiling over the alleyway has either collapsed or been removed. Looking up through it gives a cool perspective on the narrow back edge of 116 W Parish: http://imgur.com/F8JBY . Also, while I was there, I chatted with a woman who appeared to be a local business owner. She said she'd been told that the building used to be a stable, and that that was why it didn't have a roof. Not sure if that's right or not. 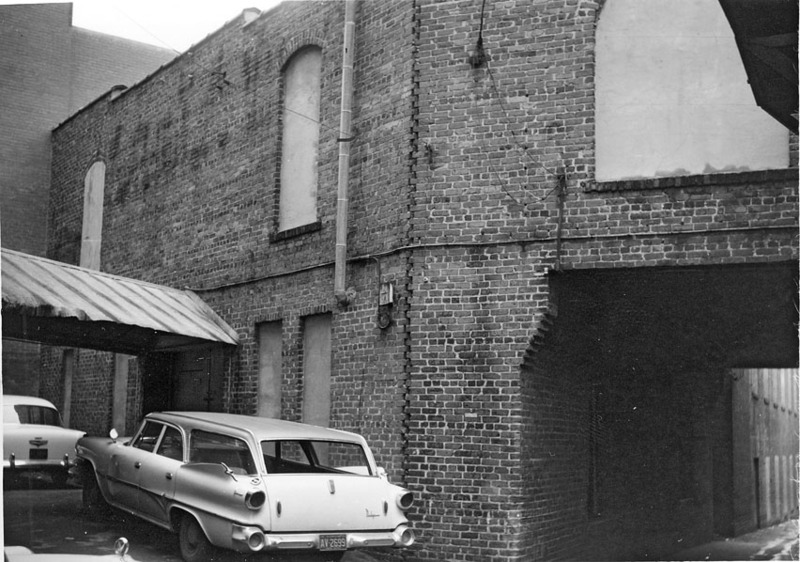 The 1959 photo above does appear to show a roof. She could have been right about the stable but wrong about the evidence, though. 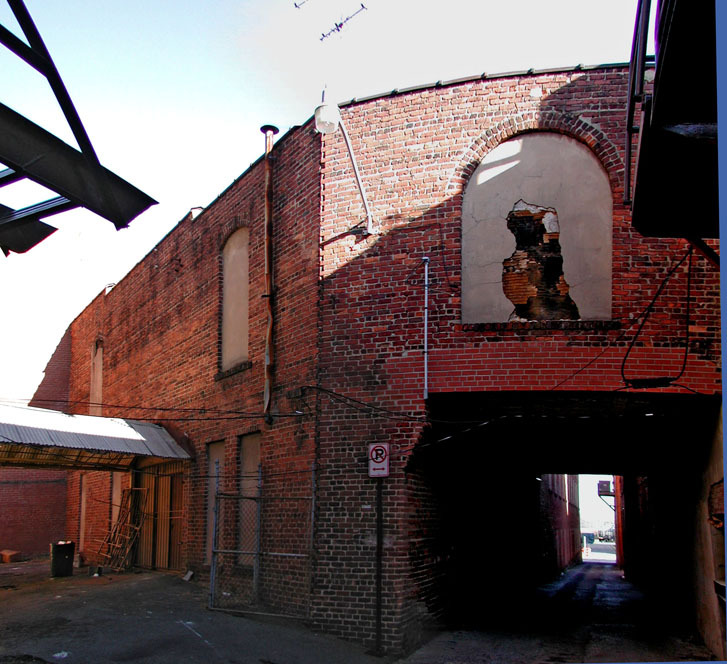 It may be apparent from this site that I have a certian predilection for interesting/quirky urban spaces, and, for me, 120 West Parrish is the oddest property in downtown Durham. To begin with, it isn't on Parrish St. In fact, it isn't on any street. It is in the middle of a block, accessible by alleyway only. The orange blob in the middle of the block is 120 W. Parrish. 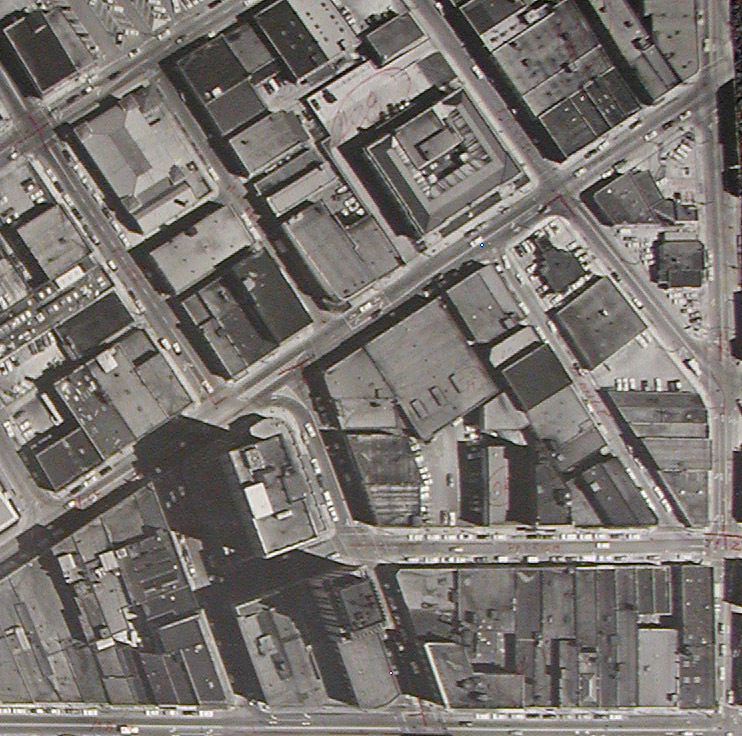 It's visible on this 1959 aerial as well. It hasn't changed much since 1963. I never would have thought that this was a separate property from the buildings on either side, but it is, owned by "Porcupine, LLC". I wish I knew more of the story of how this came to be a separate property in the middle of the block, but I guess it's good that we have some urban mystery. 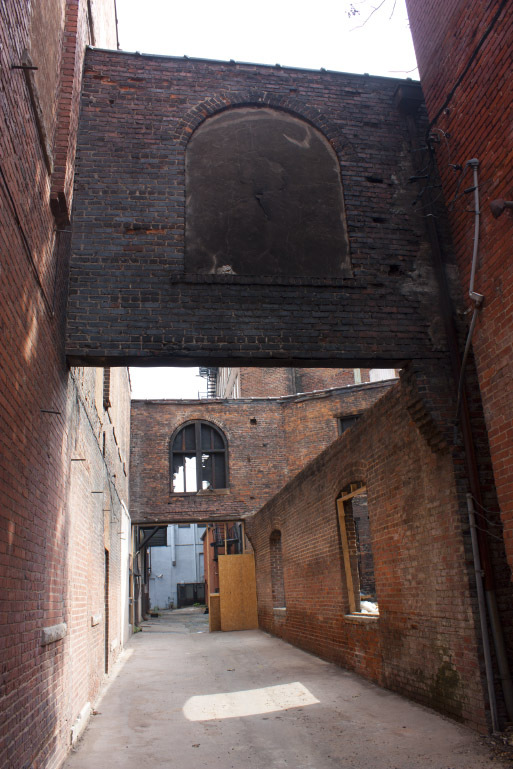 The property burned in 2009, and in tearing out the wood, the coolness of the brick walls, overhangs, angles, etc. was exposed. It seemed like an exaggeration, but it felt like a Roman ruin of some kind. This made me think of the Bridge of Sighs in Venice. 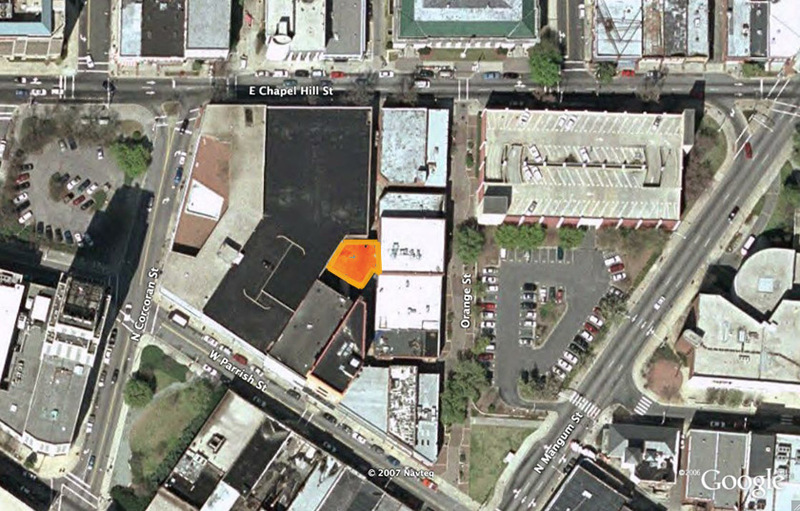 As of 2012, the property has been purchased by Eno Ventures, LLC, controlled by Arthur Rogers.